A reproducible regeneration protocol for ICGV 12991, CG 7 and Red Valencia groundnut genotypes using Cotyledonary Node explants has been optimized. The effect of different BAP concentrations combined with either 2,4-D or TDZ was tested to determine optimum conditions for high shoot induction. Different BAP concentrations were tested to determine an optimum concentration for shoot elongation. Different NAA concentrations were similarly evaluated to determine the best concentration for rooting. Media containing combination of 5 mg/L BAP and 1 mg/L TDZ was the best concentration for shoot induction while media containing BAP at 5 mg/L was the best for elongation of shoots. NAA concentration of 1 mg/L gave the highest number of plants with roots. This works provides a very good protocol which will be beneficial during groundnut tissue culture as well as genetic transformation of groundnuts. Groundnuts (Arachis hypogaea L.) are among the main economic oilseed crops, cultivated across the world. It is an oil, food and fodder crop, which largely contributes to the agricultural economies of the semi-arid tropics thereby contributing significantly to food security and alleviating poverty . In Kenya, cultivation of groundnuts has been carried out since the beginning of 20th century with the main growing areas being Western and Nyanza regions although lesser amounts are grown in Eastern, Rift valley and parts of Coastal regions . Groundnut is a major component in the diet of many in Kenya as it provides an affordable source of protein . Groundnuts oil is easily digestible and has biologically active compounds like tocopherols, flavonoids and phytosterols . Despite all the aforementioned merits, the production of groundnuts in Kenya has many challenges as its farming is affected by many factors such as attack by insect pests, diseases and drought. Some of these challenges can be addressed using tissue culture methods as well as genetic engineering. The challenge is that regeneration of groundnut is genotype dependent and takes a long time as different groundnut genotypes and explants respond differently to in vitro culture treatments . Successful regeneration of plants depends on a good in vitro regeneration protocol . There is, therefore, need of coming up with specific regeneration protocols for each groundnut genotype, which will help in achieving high regeneration frequency. Some of the existing groundnut regeneration protocols are for explants such as cotyledons . The regeneration response from the Cotyledonary Nodes (CN) has been reported to be comparatively higher than the regeneration response from other explants such as cotyledons. This is because the intersection of the cotyledon and the embryo axes has axillary meristematic cells that are highly regenerable . For this reason, therefore, optimization of in vitro groundnut regeneration protocols through direct organogenesis using CN explants is key for successful groundnut regeneration . The aim of this study was to evaluate the effects of BAP (6- Benzylaminopurine), 2,4-D (2,4-Dichlorophenoxy acetic acid) and TDZ (Thidiazuron) growth regulators for inducing shoots from CN explants of three Kenyan adapted groundnut genotypes. The effect of different BAP concentrations combined with 2,4-D or TDZ was tested in an effort to determine optimum conditions for high shoot induction frequencies. Different BAP concentrations were tested with an aim of identifying an optimum concentration for lengthening of shoots to 3 cm and above within two weeks. Different NAA concentrations were similarly evaluated to determine the best concentration for providing good root system. The research findings reported in this study provides a good protocol which will be very beneficial during groundnut tissue culture as well in work involving genetic transformation of groundnuts. The seeds of three Kenyan adapted groundnut genotypes (ICGV 12991, CG 7 and Red Valencia ) were obtained from Kenya Agricultural and Livestock Research Institute (KALRO)-Kakamega. Surface sterilization of seeds was done through vapour sterilization using sodium hypochlorite (NaOCl) and Hydrochloric acid (HCL) according to Clough and Bent . A quarter strength Hoaglands media was used for germination of groundnuts seeds in all the experiments. This media was autoclaved at 121°C at 15 ψ pressure for 20 minutes after setting the pH at 5.8 with 1 N HCL and 1 N NaOH. Three sterile seeds from each genotype were cultured into each of the culture bottles containing this media and then incubated in the dark for 12 days to provide the Cotyledonary Node explants. The Shoot Induction Media (SIM) used for culturing of Cotyledonary Node explants of ICGV 12991 , CG 7 and Red Valencia groundnut genotypes comprised of Murashige and Skoog (MS)  media supplemented with Garborg B5 vitamins  and 3% (w/v) sucrose as a carbon source. This media was autoclaved using similar procedure as the one used for Hoaglands media above. One mg/L filter sterilized 2,4-D or TDZ and different concentrations (3, 4, 5 and 6 mg/L) of 6-Benzylaminopurine (BAP) were added to the media after which it was dispensed into sterile petri plates and allowed to cool and solidify. Six Cotyledonary Node explants were cultured per plate containing SIM media and incubated under light for 14 days at 26°C. Approximately 0.6 cm long shoots were removed from SIM media and cultured into shoot elongation media which comprised of MS media  supplemented with B5 vitamins , 3% (w/v) sucrose and different concentrations of BAP (3, 4, 5 and 6 mg/L) for two more weeks. Shoots which were approximately 3 cm and above were cultured into root induction media comprising of MS media  supplemented with B5 vitamins , 3% (w/v) sucrose and different concentrations of Napthalene Acetic Acid (NAA) (0.5, 1, 1.5 and 2 mg/L). Plants with secondary roots were planted into pots containing autoclaved peatmoss (Kekkila Co. Ltd, Tuusula, Finland). These plants were later transplanted into pots containing soil, which had been mixed with sand and manure at a ratio of 1:1:1. These plants were kept in the green house where they grew to maturity. shoot induction, shoot elongation and root induction were used forAnalysis of Variance (ANOVA) was used to analyze following which Tukey’s Post hoc test was used for means separation at a confidence interval of 95%. Statistical Analysis System (SAS) version 9.1.3 software was used for analysis. Quality explants for tissue culture were obtained after 12 days upon germination of surface sterilized seeds on quarter strength Hoaglands media (Figure 1A-1H). 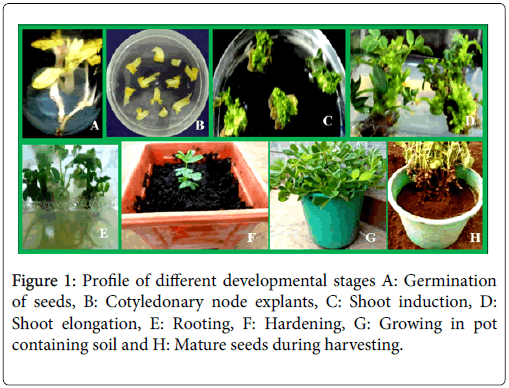 Figure 1: Profile of different developmental stages A: Germination of seeds, B: Cotyledonary node explants, C: Shoot induction, D: Shoot elongation, E: Rooting, F: Hardening, G: Growing in pot containing soil and H: Mature seeds during harvesting. After culturing the Cotyledonary Node explants in MS media  supplemented with B5 vitamins  and 3% (w/v) sucrose, the explants swelled up to twice their normal size, turned green in colour and formed shoots within 14 days (Figure 1C). Out of different BAP concentrations which were tested, 5 mg/L combined with either 1 mg/L 2,4-D or 1 mg/L TDZ gave the highest number of shoots. Medium supplemented with 3 mg/L BAP combined with 1 mg/L TDZ recorded a regeneration frequency of 80% for both CG 7 and Red Valencia genotypes and 81% for ICGV 12991 genotype (Table 1). After using media supplemented with 4 mg/L BAP combined with 1 mg/L TDZ a regeneration frequency 85% was recorded for both Red Valencia and ICGV 12991genotypes while for CG 7 a regeneration frequency of 90% was recorded. Medium supplemented with 5 mg/L BAP combined with 1 mg/L TDZ recorded a regeneration frequency of between 90% to 98% for all the genotypes while use of media supplemented with 6 mg/L BAP combined with 1 mg/L TDZ gave a regeneration frequency of between 80% to 85% for all the genotypes (Table 1). Test at p ≥ 0.05 showed no significant differences in regeneration frequencies after using regeneration media supplemented with BAP concentrations of 3 and 4 mg/L combined with 1 mg/L TDZ across all the genotypes (Table 1). Similarly, for CG 7 and Red Valencia genotypes, there were no significant differences in regeneration frequencies after using regeneration media with 5 mg/L BAP concentration combined with 1 mg/L TDZ supplementation. However, the regeneration frequency of ICGV 12991 genotype was found to be significantly different with the regeneration frequencies of CG 7 and Red Valencia genotypes at 5 mg/L BAP concentrations combined with 1 mg/L TDZ supplementation (Table 1). The trend of the three genotypes on regeneration frequencies after using regeneration media supplemented with 6 mg/L BAP concentrations combined with 1 mg/L TDZ was a reflection of their regeneration frequencies trend after using regeneration media supplemented with 5 mg/L BAP concentrations combined with 1 mg/L TDZ (b). Table 1: Regeneration frequency of three genotypes evaluated in response to four concentrations of BAP combined with 1mg/L TDZ. Values followed by the same letter(s) in the columns are not significantly different according to one-way ANOVA followed by Tukey’s pairwise comparison at 95% (p ≥ 0.05) confidence interval. Medium supplemented with 3 mg/L BAP combined with 1 mg/L 2,4-D recorded a regeneration frequency of between 63% to 65% for all the genotypes. Media supplemented with 4 mg/L BAP combined with 1 mg/L 2,4-D recorded regeneration frequency of between 70% to 75% for all the genotypes. Medium supplemented with 5 mg/L BAP combined with 1 mg/L 2,4-D recorded a regeneration frequency of between 76% to 83% for all the genotypes while use of media supplemented with 6 mg/L BAP combined with 1 mg/L 2,4-D gave a regeneration frequency of between 65% to 70% for all the genotypes (Table 2). Test at p ≥ 0.05 showed no significant differences in regeneration frequencies after using regeneration media supplemented with BAP concentrations of 3, 4 and 5 mg/L combined with 1 mg/L 2,4-D (b). However, there were significance differences in regeneration frequencies after using regeneration media supplemented with 6 mg/L BAP concentration combined with 1 mg/L 2,4-D across all the genotypes (Table 2). Table 2: Regeneration frequency of three genotypes evaluated in response to four concentrations of BAP combined with 1 mg/L 2,4-D. Medium supplemented with 3 mg/L BAP recorded shoot elongation frequencies of 33% to 40% across all the genotypes. After using media supplemented with 4 mg/L BAP shoot elongation frequencies of 30% to 46% were recorded for all the genotypes. Medium supplemented with 5 mg/L BAP recorded shoot elongation frequencies of between 70% to 80% for all the genotypes while media supplemented with 6 mg/L BAP gave shoot elongation frequencies ranging between 33% to 40% across all the genotypes (Table 3). Table 3: Shoot elongation frequency based on four BAP concentrations. Primary regenerants cultured in root induction media supplemented with different NAA concentrations (0.5, 1, 1.5 and 2 mg/L) formed roots. The number of roots formed per plant ranged from two to six. Medium supplemented with 0.5 mg/L NAA recorded rooting frequencies which ranged from 58% to 61% across all the three genotypes. After using media supplemented with 1 mg/L NAA rooting frequencies ranged from 71% to 78% for all the genotypes. Medium supplemented with 1.5 mg/L NAA recorded rooting frequencies ranging from 65% to 70% for all the genotypes while use of media supplemented with 2 mg/L NAA gave rooting frequencies of 45% to 50% across all the genotypes (Table 4). Test at p ≥ 0.05 showed no significant differences in rooting frequencies after using rooting media supplemented with 0.5 mg/L, 1 mg/L and 1.5 mg/L NAA concentrations across the three genotypes (Table 4). However, the rooting frequencies after using media supplemented with 2 mg/L NAA concentrations was the lowest. Table 4: Rooting frequency of six genotypes evaluated in response to four NAA concentrations. Values followed by the same letter(s) in the rows are not significantly different according to one-way ANOVA followed by Tukey’s pairwise comparison at 95% (p ≥ 0.05) confidence interval. The first East African adapted groundnut genotypes regeneration protocol was reported in 2010 . Different groundnut explants have been used for regeneration of shoots [11,12] but only very few genotypes have been reported. The findings reported in this study therefore add to the existing body of knowledge. In this study, a regeneration protocol for three Kenyan adapted groundnut genotypes (ICGV 12991 , CG 7 and Red Valencia ) has been optimized using Cotyledonary Node explants. The study found out that the number of explants forming shoots increased with the increase in BAP concentrations up to 5 mg/L combined with either 1 mg /L TDZ or 1 mg /L 2,4-D. However, at high BAP concentration (6 mg/L) there was decrease in the number of explants forming shoots. Regeneration of shoots from the Cotyledonary Node explants of genotype ICGV 12991 gave the highest regeneration frequency of 98% after using MS media supplemented with 5 mg/L combined with 1 mg/L TDZ. This was high compared to regeneration frequency of 87% which was reported after regenerating other groundnuts genotypes through somatic embryogenesis . During shoot induction from the Cotyledonary Node explants, BAP combined with TDZ gave significantly high number of shoots compared to BAP combined with 2,4-D in all the genotypes. In tissue culture the concentration of endogenous hormones in plant tissues are critical in the balancing of auxin to cytokinin ratio, which determines the direction of organogenesis . The results from the study showed that different BAP concentrations led to elongation of shoots. However, higher BAP concentrations (6 mg/L) proved inhibitory to lengthening of the shoots across all the genotypes, while lower BAP concentrations (5 mg/L) led to higher shoot elongation frequencies. Similar results were reported by others  in four groundnut genotypes (HNG-10, PBS24030, M-335 and M-13). The rooting of primary regenerants was optimized by using different concentrations of NAA (0.5, 1, 1.5 and 2 mg/L). All the concentrations in all the genotypes produced roots, but 1 mg/L produced the best roots within 21 days after transfer into root induction media. Similar results were observed for genotypes PBS24030, HNG-10, M-13 and M-335 . A high NAA concentration (6 mg/L) was found to affect initiation of roots in all the genotypes. This optimized regeneration protocol is recommended for the regeneration of ICGV 12991, CG 7 and Red Valencia groundnut genotypes using Cotyledonary Node explants. The protocol will be useful for groundnut tissue culture work as well as regeneration of groundnuts after genetic transformation. We appreciate Kenyatta University where the work was done and KARLO for providing groundnut seeds. Muhammad MI, Farhat N, Javaid I, Sadia T, Yusuf Z (2011) In vitro micropropagation of groundnut (Arachis hypogaea) through direct somatic embryogenesis and callus culture. Int J of Agr and Bio 13: 1560-8530. Mutegi C, Kimani J, Otieno G, Wanyama R, Christie ME, et al. (2010) Peanut aflatoxin levels under different market attributes. East African Agri Forestry J, 77: 95-103. Tuberoso C, Kowalczyk A, Sarritzu E, Cabras P (2007) Determination of antioxidant compounds and antioxidant activity in commercial oilseeds for food use. Journal of Food Chemistry 103: 1494-15501. Beena MR, Jami SK, Srinivasan T, Swathi AT, Padmaja G, et al. (2005) An efficient direct shoot regeneration from cotyledonary node explants of groundnut (Arachis hypogaea L.). Ind J of Plant Physiol 15: 131-134. Sharma KK, Anjaiah V (2000) An efficient method for the production of transgenic plants of groundnut (Arachis hypogaea L.) through agrobacterium tumefaciens-mediated genetic transformation. Plant Sci 159: 7-19. Maina SM, Quinata E, Kiran KS, Simon TG, Moses G, et al. (2010) Surface sterilant effect on the regeneration efficiency from cotyledon explants of groundnut (Arachis hypogea L.) genotypes adapted to eastern and Southern Africa. African J of Biotech 9: 2866-2871. Swathi AT, Jami SK, Datla RS, Kirti PB (2006) Genetic transformation of groundnut (Arachis hypogaea L.) using cotyledonary node as explant and a promoterless gus::nptII fusion gene based vector. J of Biosciences 31: 235-246. Clough SJ, Bett AF (1998) Floral dip: A simplified method for Agrobacterium mediated transformation of Arabidopsis thaliana. Plant J 16: 735-743. Murashige T, Skoog I (1962) A revised medium for rapid growth and bioassays with tobacco tissue cultures. Plant Physiol 15: 473-497. Gamborg OL, Miller RA, Ojima K (1968) Nutrient requirements of suspension cultures of soyabean root cells. Exp Cell Res 50: 151-158. Bhatnagar M, Prasad K, Bhatnagar-Mathur P, Narasu ML, Waliyar F, et al. (2010) An efficient method for the production of marker free transgenic plants of peanut (Arachis hypogaea L.). Plant cell Rep 29: 495- 502. Srinivasan T, Kumar K, Kirti P (2010) Establishment of efficient and rapid regeneration system for some diploid wild species of Arachis. Plant Cell Tissue Organ Cult 101: 303-309. Iqbal MM, Nazir F, Iqbal J, Tehrim S, Zafar Y (2011) In vitro micropopagation of peanut (Arachis hypogaea L.) through direct somatic embryogenesis and callus culture. International Journal of Agriculture Biology 13: 811-814. Dai W, Castillo C (2007) Factors affecting plant regeneration from leaf tissues of Buddleia species. Hortscience 42: 1670-1673. Aman V, Malik CP, Gupta VK, Sinsinwar YK (2009) Response of groundnut genotypes to plant growth regulator (BAP) to induce direct organogenesis. World Journal of Agricultural Sciences 5: 313-317. Copyright: © 2019 Limbua PG, et al. This is an open-access article distributed under the terms of the Creative Commons Attribution License, which permits unrestricted use, distribution and reproduction in any medium, provided the original author and source are credited.